Our first example of the attitude determination process is the case of the CTS spacecraft in its transfer orbit as described above. Because the purpose of attitude [email protected]&piation in the transfer orbit is to support an orbit maneuver and the nozzle of the apogee boost motor is aligned with the spacecraft spin axis, we are interested in the orientation of the spin axis in inertial space. As shown in Fig. 1-5, two types of attitude sensors are available. (Two sensors of each type were used, primarily for redundancy, but also to provide attitude information at different times.) 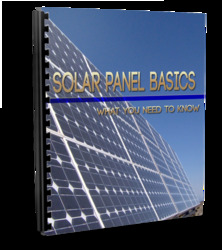 The digital Sun sensor uses a narrow slit and a pattern of photosensitive rectangles to measure the Sun angle, ft, or the angle between the spin axis and the Sun. The Sun angle is a known function of the rectangles within the instrument on which sunlight falls. The second attitude sensor is an Earth horizon telescope. 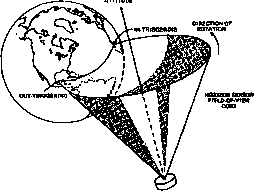 The telescope has a narrow field of view; as the spacecraft spins, this field of view sweeps out a cone in the sky, as shown in Fig. 1-6. When the sensor scans from space onto the illuminated disk of the Earth it senses a rapid change in the light intensity and produces a pulse. A second pulse is produced when the sensor leaves the Earth. These pulses, produced as the sensor crosses the Earth horizons, are called in-triggering and out-triggering, or Earth-in and Earth-out, respectively. The time between the in- and out-triggerings, together with the spin period of the satellite and the known size of the Earth, indicate how far above or below the center of the Earth the sensor is scanning. This permits computation of the nadir angle, or the angle between the spin axis attitude and the vector from the spacecraft to the center of the Earth, called the nadir vector. We know the vector from the spacecraft to the Sun and have measured the angle between the Sun and the spin axis. Therefore, in inertial space, the spin axis must lie somewhere on a cone centered on the Sun with a radius equal to the measured Sun angle. This cone about the Sun in inertial space is called the Sun cone. 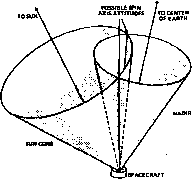 By a similar argument, the nadir angle measurement implies that the spin axis must lie somewhere on the nadir cone, or the cone in inertial space centered on the Earth's center with a radius equal to the nadir angle. The Sun and nadir cones are illustrated in Fig. 1-7. Because the spin axis must lie on both cones, it must lie at one of the two intersections. The choice of which intersection may be based on a third measurement or on a previous estimate as to the probable orientation of the spacecraft. The latter method is commonly used because, as a practical matter, the orientation of the spacecraft is almost never totaily unknown. Figure 1-7 also indicates the problems that are characteristic of attitude determination and which will be discussed throughout this book. For example, the aTttitude will be poorly determined if the Sun vector and nadir vector are both in the same direction or in opposite directions. It is also possible that because of unavoidable measurement errors, the two cones will not intersect. Even if they intersect but are very nearly tangent to each other, a small error in either measurement means a large shift in the position of the attitude and, therefore, the uncertainty in the calculated position of the attitude is large. Both the Sun sensor and the horizon sensor described above depend on the rotation of the spacecraft to scan the sky to find the Sun and the Earth. On three-axis stabilized spacecraft, this scanning motion is not available without the addition of moving parts, which are subject to wear and mechanical failure. Thus, we would like to have detectors that could sense the orientation of reference vectors over large portions of the sky without the sensor itself moving. One such sensor is the two-axis Sun sensor, or solid angle Sun sensor, which is equivalent to two of the spinning Sun sensors described above mounted perpendicular to each other, as shown in Fig. 1-8. The two Sun angle measurements from the two axes fix the orientation of the Sun in the spacecraft frame of reference. However, this does not fix the orientation of the spacecraft in inertial space, since the spacecraft is free to rotate about the vector to the Sun. That is, no information exists in the Sun measurements about how the spacecraft is oriented "around" the Sun vector. Thus, one other measurement is required to unambiguously specify the spacecraft orientation. A second reference vector commonly used on three-axis stabilized spacecraft is the Earth's magnetic field. Three mutually perpendicular magnetometers measure the three components of the Earth's magnetic field vector. * These three measurements may be combined to give the two components of the direction of the magnetic field in the spacecraft reference frame and the magnitude of the field, which can then be used as a check on the measurement accuracy. As with the Sun measurement, the magnetic field measurement does not determine the orientation of the spacecraft "around" the magnetic field vector. 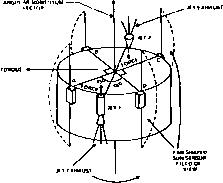 *In its attitude acquisition phase, the CTS spacecraft used two-axis Sun sensors but not magnetometers because at synchronous altitudes the Earth's magnetic field was too weak and too poorly known to provide a good attitude reference. Neither the Sun measurement nor the magnetic field measurement is alone sufficient to determine the inertial attitude of the spacecraft. However, as long as the Sun vector and the magnetic field vector are not parallel, the two pairs of measurements may be combined to determine the spacecraft orientation. Actually, the problem is overdetermined, since there are four independent measurements (two components each of the Sun vector and the magnetic field vector) and only three measurements are required to fix the orientation of the spacecraft in inertial space. For example, we could use two components to fix the orientation of the Sun in spacecraft coordinates and then use a third measurement to specify the rotation of the spacecraft about the Sun vector, thus fixing the spacecraft's orientation completely. We may see explicitly the redundant information by noting that measuring the position of both the Sun vector and the magnetic field vector allows us to calculate the angle between these two vectors in the spacecraft frame of reference. However, this angle is already known because the position of both vectors in inertial space is known and the angle between them does not depend on the frame of reference that is used. Having seen representative examples of how the attitude is determined, we will present one example of how attitude control maneuvers are performed to reorient the spacecraft from one attitude to another. Specifically, we will use the Sun vector as an attitude reference and gas jets to provide the torque to reorient the spin ajis of a spin-stabilized spacecraft. 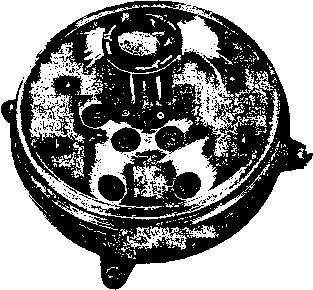 Tlie reorientation control hardware is shown in Fig. 1-9. There are four Sun sensors, each with a fan-shaped field of view, which produce a pulse as the Sun crosses their field of view. There are two gas jets that point in opposite directions, which are located on the opposite sides of the spacecraft and fire simultaneously. Because the two jets provide an equal force in opposite directions, there is no net effect on the motion of the center of mass of the spacecraft, i.e., its orbit remains unchanged. However, the jets will provide a torque in the direction shown which will change the direction, or precess, the angular momentum vector. Note that this definition of precession as the change in direction of the angular momentum vector differs from that normally used in physics. If the two jets fire continuously, the net torque integrated over a spin period is zero and the spacecraft axis will simply wobble about a position near its initial position. Therefore, the Sun sensors are used to pulse the jets, or to turn them on and off so that they only fire during one-quarter of each spin period. The choice of Sun sensors which turn the jets on and off determines the direction of the precession relative to the Sun. If sensors A and B turn the jet on and off, respectively (abbreviated A/B), then, as shown in Fig. 1-10, jet 1 will be 45 deg past the Sun when it starts and 135 deg past the Sun when it stops. The average position of the jet during firing will be 90 deg past the Sun and the average motion of the spacecraft angular momentum vector will be directly toward the Sun. The four combinations A/B, B/C, C/D, and D/A will precess the spacecraft spin axis in four different directions relative to the Sun cone, as shown in Fig. 1-11. Combinations A/B and C/D precess the spin axis perpendicular to the Sun cone either directly toward or away from the Sun. Combinations B/C and D/A precess the spin axis along the Sun cone either to the left or to the right relative to the Sun.